Posted by Jace Stolfo on Thursday, April 11th, 2013 at 12:35pm. Why are there so few homes for sale in the Boise area? Perhaps the largest contributing factor is it doesn't make financial sense for many homeowners to sell. Many people bought at the peak of the market in 2006 - 2007, and while home values have been rapidly rising, they are still substantially below where people paid (or their mortgages). Many homeowners are waiting for values to continue to rise before selling their property. Should you consider selling now? 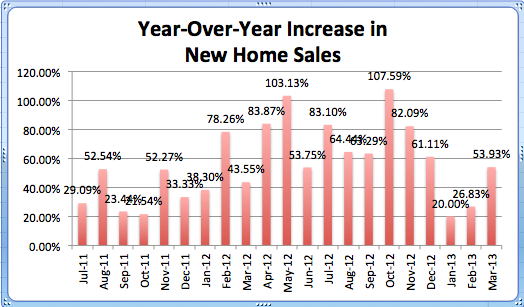 If you'd be purchasing another home, right now is an excellent time to sell a home in Ada County. Interest rates are still near historic lows, and over the life of a loan, could save you a substantial sum of interest paid. Home loan rates today are 3.5% for a 30 year fixed-rate mortgage (www.iccu.com on 4/11/13). For a $200,000 mortgage, the total interest paid over 30 years would be $123,311.97. If interest rates went up to 5.5%, the total interest paid over 30 years would be $208,806.9. Interest Rates about 5 years were between 5.5% - 6.5% (which were still considered historically low). If you'd be selling, but not entering the Boise home market to purchase, right now might not be the ideal time to sell. Most indicators seem to point to a continued upward pressure on home prices, and it may be a better financial decision to wait. Another option some homeowners consider is to turn their current property into a rental, and purchase another property. That way they try and secure the "best of both worlds" - Rising home prices on their existing home, while locking in a low-rate (and still relatively low home price) on the new home. Of course, there's some cons to this approach as well like finding a quality tenant, landlord headaches, and more lending restrictions. If you'd like to discuss these options and the details of your specific situation, please feel free to contact us.